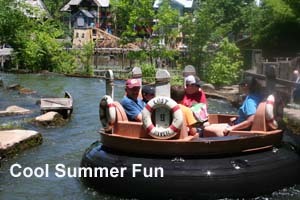 Summer has only begun and KidsFest 2012 at Silver Dollar City near Branson, Missouri, is in full swing. Boasting the biggest KidsFest in America, the 1890’s reproduction theme park has planned everything bigger and better for kids of all ages. KidsFest started June 9 and runs through July 24, so there’s still plenty of time for RVers—kids optional—to experience the fun of this summer festival. Moonlight Madness takes over on July 21 and some of the KidsFest acts run until August 4. Although aimed at youngsters, the rides and family entertainment appeal to all who are kids at heart. The Fabulous Wallendas! Famous Family Circus return by popular demand to headline America’s favorite destination for family vacations. Created exclusively for Silver Dollar City, Nik Wallenda, “King of the High Wire” and double Guinness World Record holder performs with his High Wire Walkers through August 4. 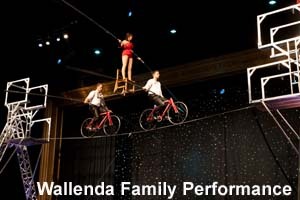 A seventh generation Wallenda, Nik and his family are also winners of the admired Silver Clown Award. 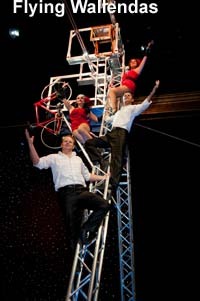 The High Wire Walkers perform three shows daily Monday through Saturday in Silver Dollar City’s Opera House. On the evening of June 15, 2012, Nik Wallenda defied death in an 1800-foot crossing of Niagara Falls from the United States to Canada. His mark in history is secured as the first person ever to walk a tightrope over the world-famous falls. An estimated 112,000 people crowding the shores of both countries cheered Wallenda in what he described as his quest to honor his ancestors who trace their roots to 1780 Austria-Hungary as acrobats, aerialists, jugglers, animal trainers and trapeze artists. His family has known tragedy, notably in 1978 when patriarch Karl Wallenda, Nik’s great-grandfather, fell to his death during a stunt in Puerto Rico. Wallenda told reporters that in the middle of his walk, his thoughts were on his great-grandfather. Millions in a television audience stretching around the globe watched the broadcast of a feat more than two years in the planning stage. Upon reaching the platform on the Canadian side of the falls, officials required his passport and asked why he was entering the country. He answered: “I hope what I do and what I just did inspires people around the world to reach for the skies.” This summer at KidsFest, travelers have a second opportunity to see the Wallenda family perform. Nik Wallenda announced that his next super-sized feat will be a walk across the Grand Canyon. Featured in the Red-Gold Heritage Hall June 9-July 22, Luma, a light, color, and motion show takes the stage on Fridays through Wednesdays. The show combines high tech lighting with gymnastics, juggling, puppetry, and dance. New for 2012, Gazillion Bubbles is an interactive show featuring bubbles with lasers, special lighting effects and incredible bubble masterpieces created before a live audience. Gazillion Bubbles has thrilled audiences in Asia, as well as North America, and has been featured on LIVE! With Regis & Kelly, The Ellen Degeneres Show, and The Today Show. The lighthearted show appeals to the whole family. A National KidsFest tradition for over 20 years, Championship Clogging showcases some of the nation’s most talented dancers on the Gazebo stage at Silver Dollar City’s Main Street. The energetic show is written, choreographed and directed by competitive dance veterans Blake Bartlett-Dunn and Heather Bartlett-Kohberger. Blake and Heather have danced together most of their lives and began teaching in their teens. They opened their first studio in 1995 and captured their first National Champion Clogging title in 1997. A new Independence Day Celebration July 4, 2012 begins with an opening ceremony and a morning salute to veterans. The park is open until 10:00 p.m. and features an old-fashioned ice cream social and fireworks. Over 30 rides and attractions for all ages await families seeking summer fun. The Giant Swing, WildFire®, and PowderKeg® spell super-swooping and upside-down looping thrills, blasting off even into the darkness during Moonlight Madness evenings July 21-August 5. RiverBlast, Lost River of the Ozarks, and American Plunge soak summer adventurers with splashes of cool water. Ten family rides wait at The Grand Exposition, and smaller kiddos find fun at the World’s Largest Treehouse at Geyser Gulch®. Half Dollar Holler, Silver Dollar City’s newest addition opened in 2011, aims at the three to seven age crowd and features treetop fun houses, climbing nets, sand play, and Hugo & Mary’s hand-carved carousel. Nightly street dances stretch fun under the stars during Moonlight Madness. 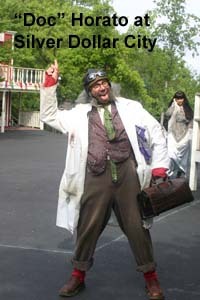 Throughout the daytime, impromptu street shows take place with Silver Dollar City’s costumed characters such as the undertaker, Mr. M. Balmer, the mad scientist, ‘Doc’ Horatio Harris, and feuding hillbillies, the Hatfields and McCoys. Silver Dollar City’s regular shows at the Silver Dollar Saloon and McHaffie Homestead continue throughout KidsFest. Food is always an important part of a Silver Dollar City visit, and KidsFest is no different. Sugary aromas wafting above the shady sidewalks whet appetites for slushy lemonades and funnel cakes from street vendors. The City’s restaurants cook up hearty meals with choices of yummy breakfast and lunch buffets, barbeque ribs and chicken, and hamburgers with all the trimmings. At the Culinary & Craft School, children are welcome to register for classes (accompanied by an adult) scheduled throughout the summer. A nominal fee is in addition to a Silver Dollar City ticket and reservations are required. GAC Nights in Echo Hollow®, a live version of the popular television show, “Great American Country,” ends a perfect day at Silver Dollar City’s KidsFest. The show runs Tuesday through Sunday evenings after the park’s closing.